The valet to the British ambassador in Turkey during WWII decides to improve his lot by selling his employer’s top-secret documents to the Nazis in this classic spy film starring James Mason. Based on the true story of Elyesa Bazna, one of the most famous spies of World War II, the film was nominated for two Academy Awards®. 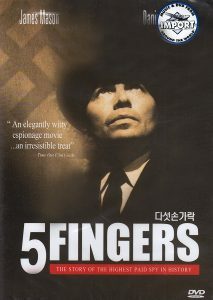 In short, 5 Fingers is an absolutely riveting spy movie, set towards the end of World War II. James Mason gives an excellent performance as the spy Cicero. He portrays this traitor sympathetically – a servant who’s tired of serving others. A man who wants the finer things in life – including the widow of a Polish nobleman whom he once served. Excellent performances all around, including Michael Rennie as the English agent who suspects, and tracks down, the traitor. The ending is riveting, as Cicero suffers betrayal, and is wanted by both the English and the Nazis. The very ending has an unexpected twist, that I won’t spoil here. You’ll want to enjoy it for yourself. As with so many Hollywood biographies and historical stories, there are large inaccuracies. But if you’re watching 5 Fingers for entertainment, it really won’t matter. I recommend 5 Fingers very highly. Ulysses Diello (James Mason, 20,000 Leagues Under the Sea). Aka Cicero – the central character, a man of contradictions. He’s willing to betray secrets to Nazi Germany – who he thinks is doomed to lose the war. He’s in love with Anna – but lets her know he won’t trust her with his money. A cultured man, who risks everything – and in the end, loses. Countess Anna Staviska (Danielle Darrieux, Persepolis). The lovely, intelligent widow whom Cicero is in love with. And many of the various ambassadors are infatuated with her, as well. A strong woman, who is not afraid to take her fate into her own hands. Colin Travers (Michael Rennie, The Day the Earth Stood Still). The British counter-intelligence man sent to investigate the leaks coming out of the embassy. He eventually suspects Cicero, and even rescues him from his Nazi “bodyguards” after the worm turns. Based on the true story of a World War II spy with access to top secret information in the British embassy in Turkey, this film follows the brief but bright career of an English valet, code-named Cicero, who seized his chance to sell expensive secrets to the Germans, including details about D-Day’s Operation Overlord. The Nazi government, the British ambassador, and a Polish countess all dance on Mason’s strings even as British counteragents close in. In the finest tradition of war intrigue films such as CASABLANCA, FIVE FINGERS is woven with patriotism, passion, war weariness, and greed, spearheaded by a magnificent performance by Mason as the tightly controlled valet who maintains his cool and ambition even in the face of his deteriorating plans. Director-writer Joseph L. Mankiewicz was nominated for Oscars for Best Director and Best Screenplay for his handiwork. FIVE FINGERS was based on the book OPERATION CICERO, by L.C. Moyzisch, the military attaché at the German embassy in Ankara, Turkey, who had dealings with the infamous spy. The real Cicero was Elyesa Bazna, an Albanian. In his book, “I Was Cicero” he retells the story, listing his collaborators as a chambermaid and his niece. The character of the countess was a Hollywood fabrication. The £120,000 the Germans paid to Cicero would, after taking into consideration the exchange rates and adjusting for inflation, be equivalent to about $8,000,000 in 2014. Ambassador Franz Von Papen was a former Chancellor of Germany. After he resigned from office, he worked with the Nazis and helped get Adolf Hitler appointed as Chancellor. He was instrumental in the rise of the Third Reich. Director Mankiewicz met the real spy code-named Cicero while filming in Turkey. The former spy, Elyesa Bazna, offered to serve as a technical advisor on the film was turned down. His former Nazi handler, German diplomat Moyzisch, also made the same offer to the producers but he was turned down. After the film’s release, Moyzisch was very displeased by the depiction of him and requested that his name be taken off the credits.